WEST EDMONTON MALL - the largest shopping mall in North America and the tenth largest in the world. West Edmonton Mall covers a gross area of about 490,000 sq m (5,300,000 sq ft). There are over 800 stores and services and parking for more than 20,000 vehicles. More than 24,000 people are employed at the property. The mall receives 32.2 million visitors per year; it also attracts between 90,000 and 200,000 shoppers daily, depending on the day and season. Bloor Street - home to the most expensive retail space in Canada. 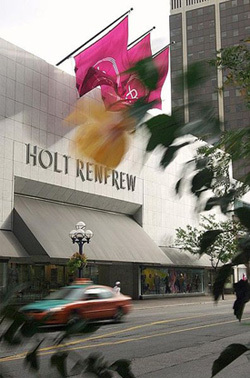 Holt Renfrew - high-end Canadian department store. 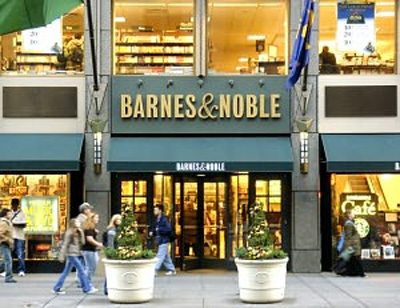 It is comparable to Barneys New York and Saks Fifth Avenue in the United States. Queen Street West - best known as a centre for Canadian broadcasting, music, fashion, performance, and the visual arts. Centro Comercial Santa Fe - large enclosed shopping mall in the Santa Fe area of Mexico City, approximately 400,000 square metres (4,305,564 sq ft) in size. 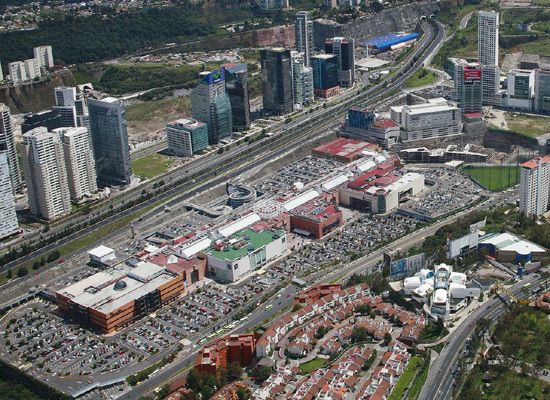 Centro Santa Fe is the largest shopping center in Latin America, 108,000 square metres (1,162,502 sq ft). It offers a unique upscale shopping experience featuring around 285 stores selling top brands and the top boutiques of Mexico. Perisur - located in the southwest part of the city, Perisur is one of the largest and classiest shopping centres of Mexico City. It houses over 230 stores with high-end designer labels and a large selection of clothing, shoes, accessories, items for the home and many more. The centre also provides beauty salons, banks, travel agencies and other service providers as well as 25 eateries and a 20-screen cinema for entertainment. JEFFREY - 3500 Peachtree Rd. N.E. Fashion store. "Los Angeles' best shopping area, like so much else, is in Beverly Hills, the rhombus limited by Wilshire and Little Sanata Monica Boulevards, by Bedford and Cañon Drives, with North Rodeo Drive - the oligarchy's favorite trekking path - right in the middle." 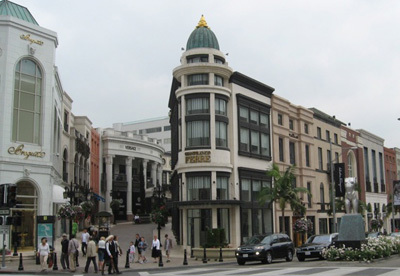 BEVERLY HILLS CITY GUIDE - reviews and recommendations by Citysearch. RODEO DRIVE - official site. 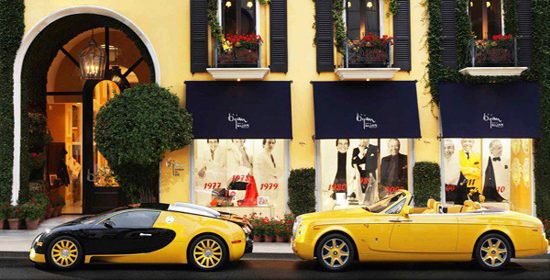 BIJAN - 420 North Rodeo Drive. By appointment only: menswear, perfume, jewelry, watches, bulletproof lined jackets, accessories. CHANEL BOUTIQUE - 400 North Rodeo Drive. 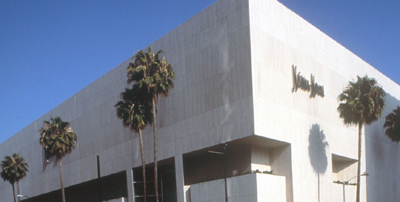 NEIMAN MARCUS - 9700 Wilshire Boulevard. 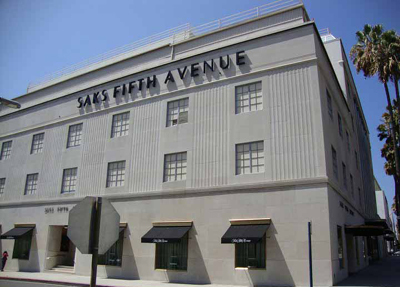 SAKS 5TH AVENUE - 9600 Wilshire Boulevard at S Peck Drive. 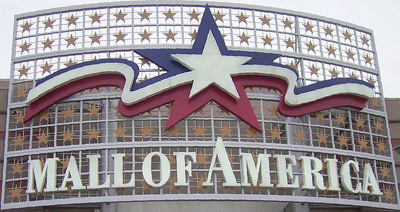 MALL OF AMERICA - the second largest mall in North America. Newbury Street - "Rodeo Drive of the East." Located in the Back Bay area of Boston. It runs roughly east-to-west, from the Boston Public Garden to Massachusetts Ave. The road crosses many major arteries along its path, with an entrance to the Mass Pike westbound at Mass Ave. East of Mass Ave, it is a mile long street lined with historic 19th-century brownstones that contain hundreds of shops and restaurants, making it a popular destination for tourists and locals. 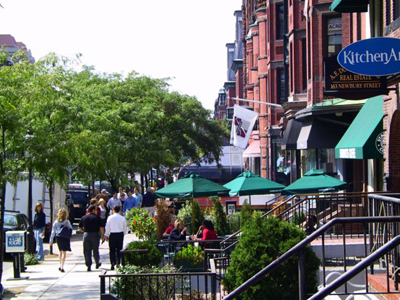 The most "high-end boutiques" are located near the Boston Public Garden end of Newbury Street (ironically referred to as "lower Newbury" due the street numbers). As the address numbers climb, the shops become slightly less expensive and more bohemian up to Massachusetts Avenue. Newbury Street has an eclectic mix of shops and eateries. Its renovated brownstone buildings feature stores at all retail levels, -- physically (basement, street level, and above), stylistically (shabby chic to elegant), and financially (affordable to exclusive). There are coffee shops, trendy cafes and an array of restaurants to suit many tastes. Yet due to the concentration of up-scale stores at its lower end, it is touted as one of the most expensive streets in the world. Luxury goods stores include Ralph Lauren, Chanel, Armani, Nanette Lepore, Ted Baker, Ben Sherman, Donna Karan, Burberry, Cartier, Loro Piana, Kate Spade, Bang & Olufsen, Valentino, Marc Jacobs and Ermenegildo Zegna. Marshall Field's - (1852-2006). Was an upscale department store in Chicago, Illinois, that grew to become a major chain before being acquired by Macy's, Inc., on August 30, 2005. MORRIS & SONS - since 1952. Clothier for men and women. 557 W. Polk Street. SHRINE - Haberdashers. "Committed to making the world's finest and most obscure artisan-crafted men's accessories available to all." 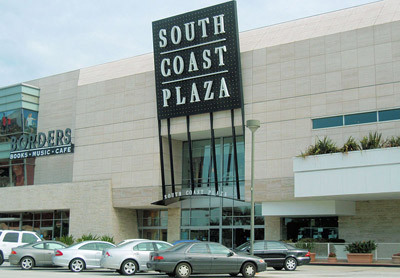 SOUTH COAST PLAZA - upscale-luxury shopping center. The largest mall in California. 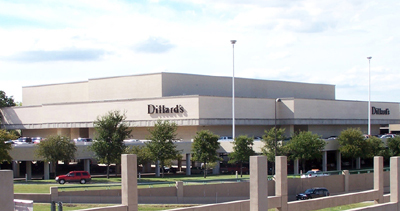 Dillard's - flagship department store at NorthPark Center. NEIMAN MARCUS - founded 1907. 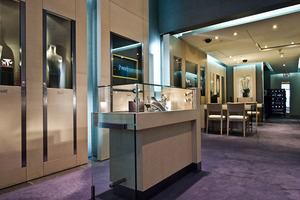 Luxury specialty retail department store. NorthPark Center - 8687 North Central Expressway. VON MAUR - family owned since 1872. 25 upscale department stores with wide selection of brand-name merchandise in Illinois, Indiana, Iowa, Kansas, Kentucky, Michigan, Minnesota, Missouri, Nebraska and Ohio. A hallmark of some of the Von Maur services are a no-interest bearing credit card account, free shipping and free gift wrapping offered every day. 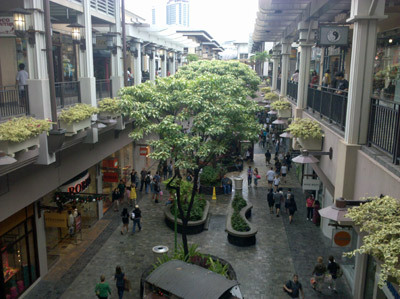 Ala Moana Center - opened in 1959. The largest open air shopping mall in the world. 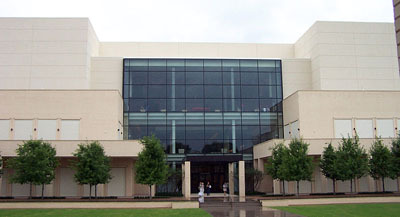 Over 260 stores and restaurants as well as four well known department stores, including Macy’s and Neiman Marcus. Kalakaua Avenue - the main thoroughfare of Waikiki, named after Hawaii's last reigning king King Kalakaua, which houses most of the high-end hotels (Royal Hawaiian, Sheraton, Hyatt, Moana Surfrider Hotel), most of the luxury designer brand stores (Apple Store, Chanel, Louis Vuitton, Prada, Burberry, Dior, Tiffany & Co., Fendi, Cartier, Gucci & Coach) and popular surf clothing brand stores (Quiksilver, Billabong, Volcom). Royal Hawaiian Shopping Center - 2201 Kalakaua Avenue. AMERICAN RAG COMPAGNIE - flagship store: 150 South La Brea Avenue. One of the most innovative and trendsetting retailers in the United States. BEVERLY CENTER - opened in 1982. Located at the edge of Beverly Hills and West Hollywood. Anchor tenants include Macy's,and Bloomingdale's. LISA KLINE - upscale fashion boutique with large celebrity following. MAXFIELD - attracts a bounty of celebrity shoppers. OPENING CEREMONY - multifaceted environment comprised of retail spaces, showroom, and gallery that establishes a new international creative forum. Opening Ceremony brings together emerging American talent with both young and established designers and artists from abroad. "If you can't find it in New York, you can't find it anywhere. The small sector of Fifth Avenue from Rockefeller Cetner to the Plaza Hotel, is the heart of the shopping metropolis of the world. The arteries stretch out onto Madison Avenue, Park Avenue, Lexington Avenue and the Village in the south of Manhattan." FIFTH AVENUE - the main shopping street of New York City. 280 Broadway - also known as the A.T. Stewart Dry Goods Store, the Marble Palace, and the Sun Building – an historic building located between Chambers and Reade Streets in the Civic Center district of Manhattan, New York City, was the first commercial building in the Italianate style in New York City. 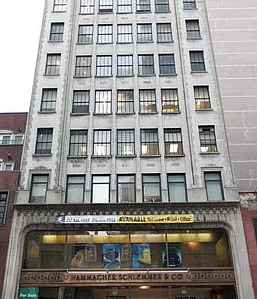 The building was declared a National Historic Landmark in 1965, and was designated a New York City landmark in 1986. 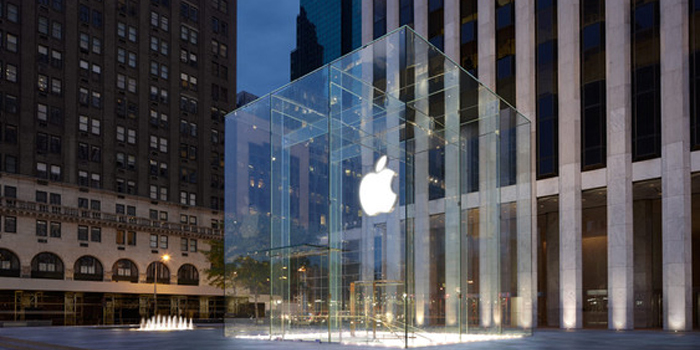 APPLE - flagship store: 767 Fifth Avenue. The store grosses more per square foot than any store in the world - also more in total, in absolute dollars. ABERCROMBIE & FITCH - flagship store: 720 Fifth Avenue. 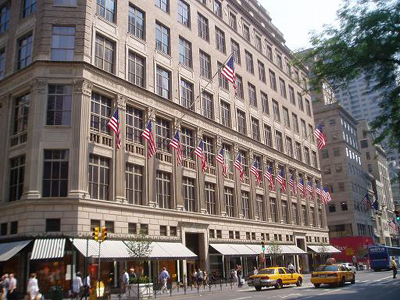 BARNEYS NEW YORK - luxury department chain store founded in 1923. Flagship store: 660 Madison Avenue. 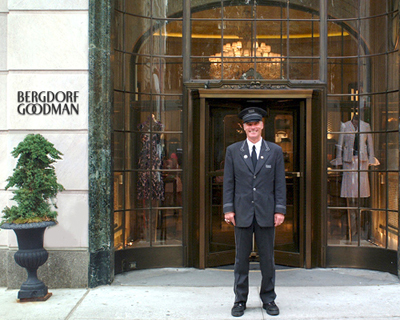 BERGDORF GOODMAN - luxury goods department store founded 1899. 754 Fifth Avenue. BEST & CO. - clothing chain that operated from 1879 to 1971. 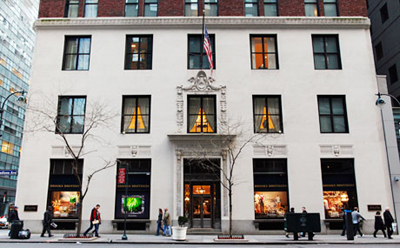 Its final 12-story flagship store was located at Fifth Avenue and 51st Street, directly north of St. Patrick's Cathedral. It was acquired by the company in 1944, from the Union Club. After it closed in late 1970, the beautiful white marble building was torn down and the Olympic Tower was built in its place. BLOOMINGDALE'S - affectionately referred to as "Bloomie's," upscale chain of department stores owned by Macy's, Inc. Founded in 1861. Flagship store: 59th Street and 3rd Avenue. BROOKS BROTHERS - oldest men's clothier chain in the United States. Since 2001 and now also features clothing for women. Business and casual clothing for men and women. Founded in 1818. Flagship store: 346 Madison Avenue. 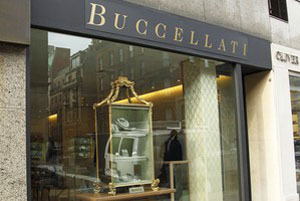 BUCCELLATI - founded in 1919. Flagship Store: 810 Madison Avenue. 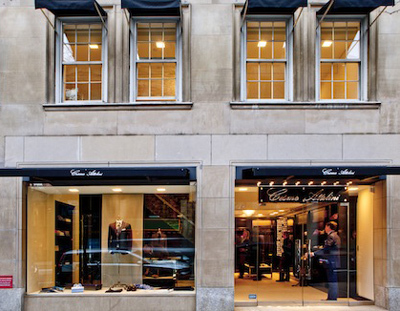 Cesare Attolini - flagship store on 798 Madison Avenue, at the corner of 67th Street in Manhattan. Synonym of Naples' tailoring tradition all around the world. 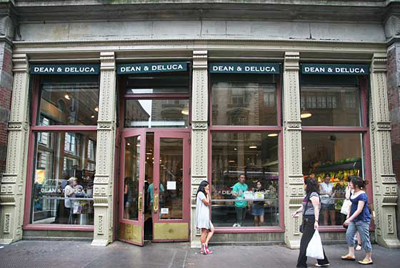 DEAN & DELUCA - since 1977. Chain of upscale grocery stores and online gourmet suppliers. Dominique Ansel Bakery - 189 Spring St, Soho, New York, NY 10012, U.S.A. One of "Top 10 Pastry Chefs in the United States" by Dessert Professional Magazine. 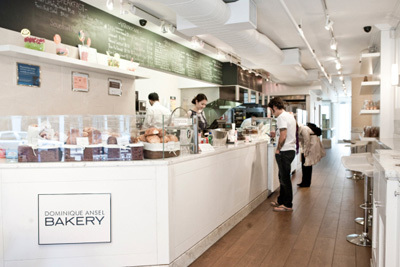 Winner of Time Out New York's Best Bakery 2012. Specialty: the Cronut (Half Croissant, Half Doughnut). EATALY - 200 5th Avenue, New York City, NY 10010. High-end Italian food market / mall chain which first opened in Turin, Italy, in January 2007. The New York City Eataly 50,000 square-foot emporium opened in August 2010. 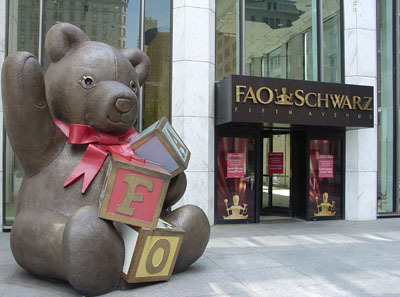 FAO Schwarz - founded in 1862. 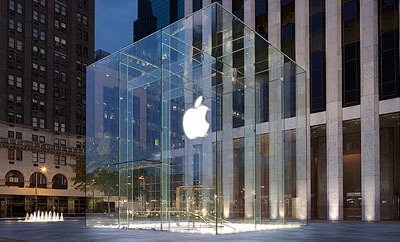 Flagship Store: (General Motors Building) 767 5th Avenue @ 58th St., New York City, NY 10153. The oldest toy store in the United States. The company is known for its unique high-end toys, life-sized stuffed animals, dolls, and games. The FAO Schwarz flagship store on Fifth Avenue in New York City is a popular tourist destination, and has gained iconic status for its floor piano, cameos in major motion pictures, and real-life toy soldiers. FOLEY & CORINNA - 114 Stanton Street. hammacher schlemmer - founded 1848. 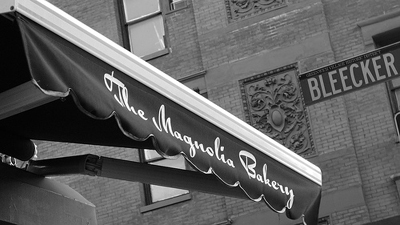 Flagship store: 145 East 57th Street, New York, NY 10022. HARRY WINSTON - founded 1932. Flagship Store: 718 5th Avenue at 56th Street. 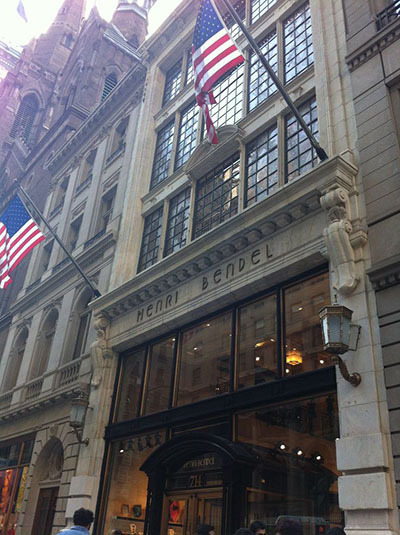 HENRI BENDEL - founded 1895. 712 Fifth Avenue. Upscale women's specialty store based in New York City that sells fashion accessories, cosmetics and fragrances, gifts and gourmet foods. IF - 94 Grand St. Fashion store. JEFFREY - 449 West 14th St. Fashion store. KITON - 4 East 54st Street. Kiton's U.S. flagship store. LEDERER DE PARIS - 625 Madison Ave. The leading luxury leather store that has been gracing the fashion industry in Paris, London and New York since 1898. LORD & TAYLOR - 424 Fifth Avenue. Founded 1826. The oldest upscale, specialty-retail department store chain in the United States. MACY'S - founded 1858. Flagship store at Herald Square, between 34th and 35th on Broadway. MASSIMO BIZZOCCHI - 433 West 14th Street. "A window to a world of artisan crafted clothing and accessories from Italy and New York." 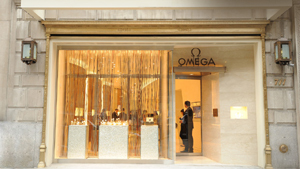 OMEGA FINE JEWELLERY - founded in 1848. 711 Fifth Avenue. OPENING CEREMONY - 35 Howard Street. Multifaceted environment comprised of retail spaces, showroom, and gallery that establishes a new international creative forum in downtown Manhattan. Opening Ceremony brings together emerging American talent with both young and established designers and artists from abroad. PIAGET - founded in 1874. 730 Fifth Avenue. PRADA - 575 Broadway, at Prince St. (SoHo). Prada's Rem Koolhaas US$40 million designed flagship store. Pucci - flagshipstore. Madison Avenue at 71st Street. World's largest Pucci store. The interior is modeled after the Palazzo Pucci in Florence. 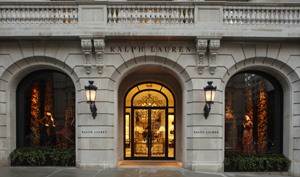 RALPH LAUREN - flagship stores: 867 (for men) & 888 Madison Avenue (for women). 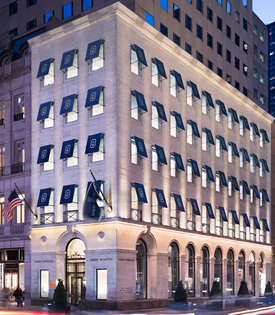 RALPH LAUREN FINE JEWELRY STORE - 888 Madison Avenue. ROGAN STORE - "ROGAN continues to fuse the traditional, experimental, rural and urban with clothing, architecture and art." 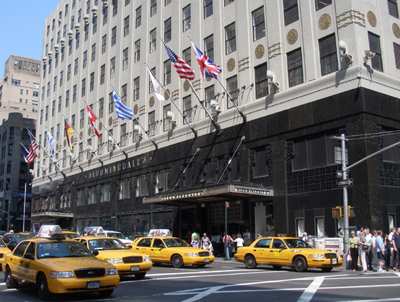 SAKS FIFTH AVENUE - luxury specialty department store chain founded in 1898. Flagship store: 611 Fifth Avenue. 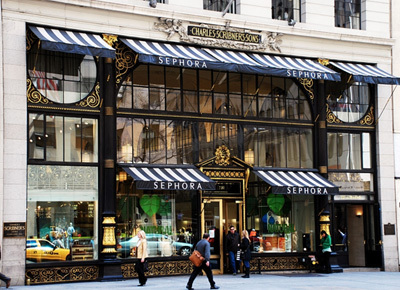 Sephora - flagship store: 597 5th Avenue, New York City, NY 10017. Chain of cosmetics stores founded in France in 1993 and acquired by Paris-based conglomerate LVMH in 1997. The Sephora chain includes more than 750 stores in 21 countries. It carries over 250 brands of items that include makeup, skin care, fragrance, bath, hair products, hair tools, and other beauty accessories, including Sephora's own private label. TIFFANY & CO. - since 1837. Flagship Store, 727 Fifth Avenue & 57th Street. W. & J. Sloane - (1843-1984). 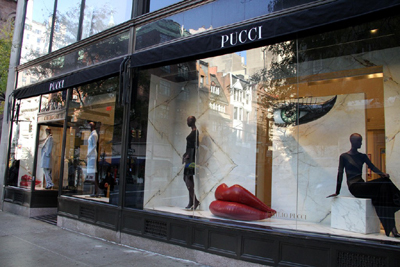 Flagship store at 8 West 38th Street, New York City. Furniture and rug store in New York City that catered to the wealthy. Over the years Sloane's clients included everyone from the novelist Washington Irving to John D. Rockefeller, founder of Standard Oil. WOOLWORTH'S - (1879-1997). One of the original American five-and-dime stores. I. Magnin & Company - was an Oakland, California-based high fashion and specialty goods luxury department store. The chain's flagship Oakland store was located at 20th and Broadway in downtown Oakland next to the Paramount Theatre. "More than one hundred years ago, railroad tycoon Henry Morrison Flagler established Palm Beach as a beach resort for his contemporaries, hundred years ago, art maecenas Addison Mizner, together with his friend and financier Paris Singer of the sewing machine dynasty, added the shopping nirvana to it: Worth Avenue - a mini-miracle mile for exclusive, extravagant and sinfully expensive shopping." 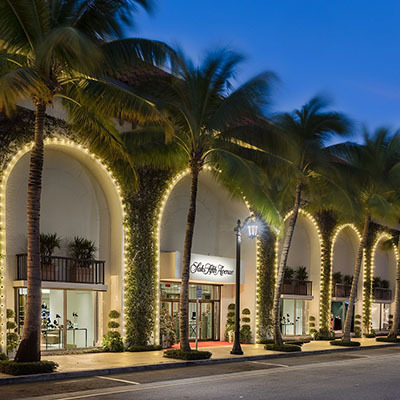 WORTH AVENUE - sometimes referred to as the Rodeo Drive of Florida, is a famous upscale shopping district in Palm Beach. The epitome of Palm Beach style. The avenue's oldest store, Kassatly's, has been in business since 1923. Reflecting the lifestyle of Palm Beach market, the street has approximately 250 high-end shops, boutiques, restaurants, and art galleries, that include Giorgio Armani, Neiman Marcus, Cartier, Louis Vuitton, Tiffany & Co., Tourneau, Hermès, Ralph Lauren, Gucci, Chanel, Vineyard Vines, Brooks Brothers, Hamilton Jewelers, Salvatore Ferragamo, Island Company, Intermix, St. John Boutique (clothing), Valentino, and many more. An open-air mall, 150 Worth (Formerly, The Esplanade), lies at the eastern end of Worth Avenue. 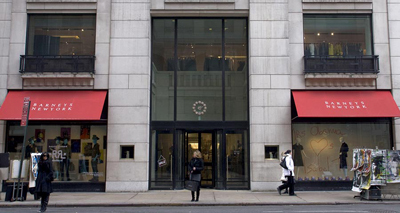 150 Worth offers a variety of upscale shops anchored by department stores Saks Fifth Avenue. Gucci - 150 Worth Avenue. Neiman Marcus - 151 Worth Avenue. Saks Fifth Avenue - 172 Worth Avenue. The Church Mouse - since 1970. 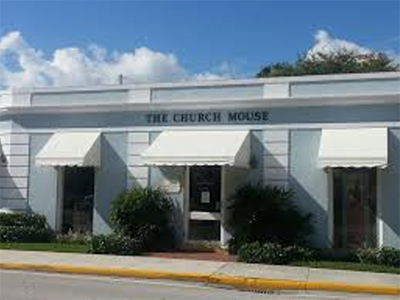 "The Church Mouse is a volunteer-run high-end resale shop benefiting local charities & is owned by the Church of Bethesda-by-the-Sea. Hours M-Sa, 10am - 4pm." 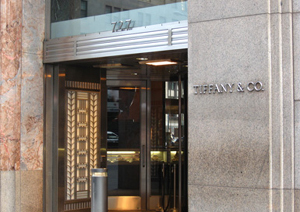 Tiffany & Co. - 259 Worth Avenue. TRILLION - 315 Worth Avenue. Fashion store. Wanamaker's - department store. Was the first department store in Philadelphia, Pennsylvania, and one of the first department stores in the United States. 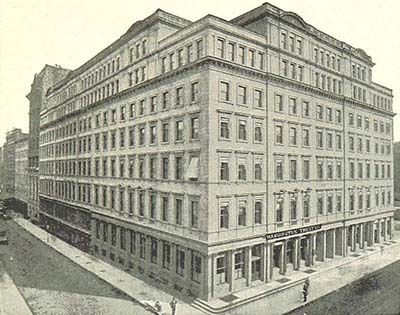 At its zenith in the early 20th century, there were two major Wanamaker department stores, one in Philadelphia and one in New York City at Broadway and Ninth Street. Both employed extremely large staffs. By the end of the 20th century in the shopping-mall era, there were 16 Wanamaker's outlets, but the chain was absorbed into Hecht's (now Macy's) in 1995 after years of change. 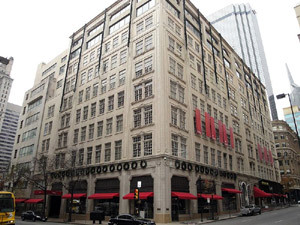 As of 2012, the occupant of the former Philadelphia Wanamaker's Department Store is Macy's Center City. Bullock's - founded in 1907. Was a department store chain, headquartered in Los Angeles, California. The company operated full-line department stores all across California, with some stores in Arizona and Nevada. Bullock's also operated the more upscale Bullocks Wilshire in parts of Southern California. GAP - largest specialty apparel retailer in the U.S with 2,551 stores in the United States. I. Magnin - (1876-1994). Was a San Francisco, California-based high fashion and specialty goods luxury department store. Wingtip - 550 Montgomery Street. The ultimate store to find gifts for the Guy who has Everything! Listed as one of the Top 10 Men's Stores in the country by Forbes.com. NORDSTROM - founded 1901. Upscale department store chain in the U.S. Operates 112 full-line department stores in 28 different states. SAWGRASS MILLS and The Colonnade Outlets - the sixth largest mall in the United States, and the second largest in Florida. FRED SEGAL - upscale and trendy Los Angeles, California based clothing retailer. LINDA MCNAIR - fine apparel, shoes, designer bags & jewelry.